When Little Holly was found by then-Torrance County Undersheriff Heath White, the days-old foal was not given much of a chance to survive. But, through the dedication of New Mexico Horse Rescue at Walkin N Circles Ranch and Western Trails Veterinary Hospital, Holly is 10. Even though Holly’s treatment cost ($5,000 for the first month alone) was higher than the norm for a rescue, running a volunteer organization like Walkin N Circles is expensive even with more typical costs. The ranch’s June 9 Jamboree is its major fundraiser, according to executive director Char Hudson. The event featured live music, ranch tours, pony rides and more. 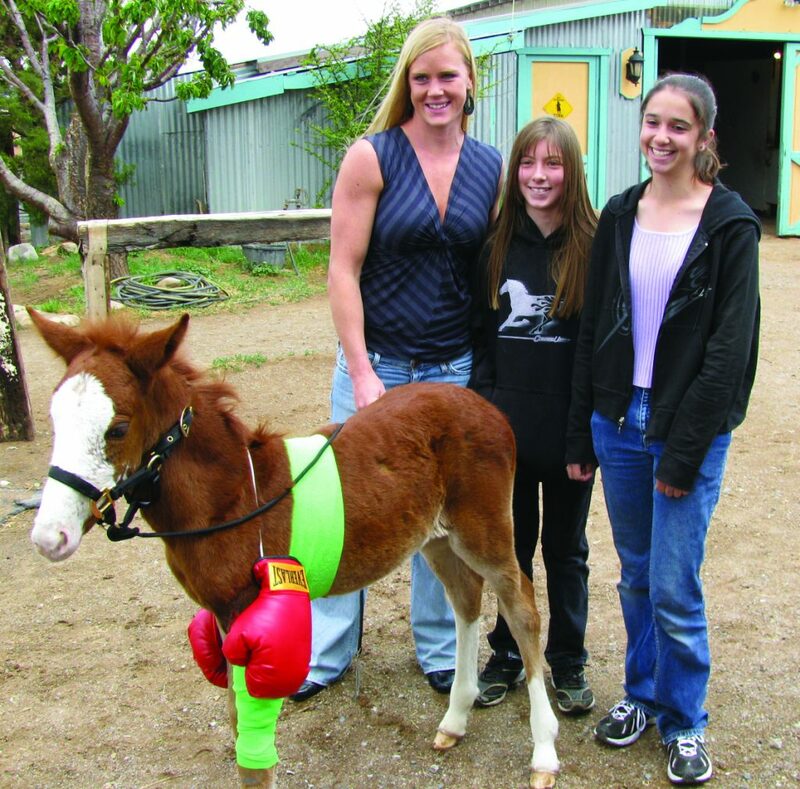 All proceeds of fundraisers like this one go to taking care of horses like Little Holly. White said he thought that Holly was “dead but I had to give her a chance,” after finding her on an Estancia porch suffering, after a dog attack in 2008. “She was not visibly breathing and I couldn’t find a pulse,” White added. 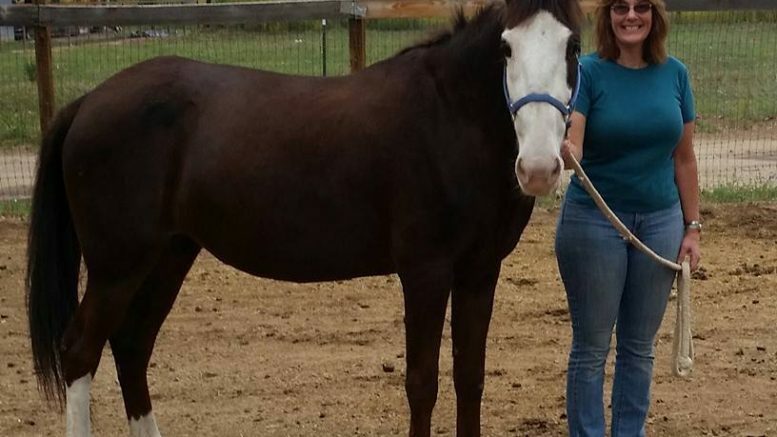 He immediately placed the severely malnourished and wounded foal into the back seat of his cruiser, taking her to Western Trails where veterinarian Katie Sandstede began nursing Holly’s wounds. Crystal Montoya and Sami Chavez gave her milk and and the colostrum necessary for her healing and growing. After a few days of round-the-clock feeding and treatment, Holly was brought to Walkin N Circles. The little 60-pound fighter got better and gained 100 pounds in the next couple of weeks, also gaining her name from a more famous fighter, world champion boxer Holly Holm. Holly eventually healed and became sort of a pet at the ranch for the next few years. She was fostered out a few times but she really didn’t find a good fit until Sarah Turner of Bosque adopted her in January 2015. Holly had already grown to her full height but at 14.2 hands is almost small enough to be classified a miniature horse. 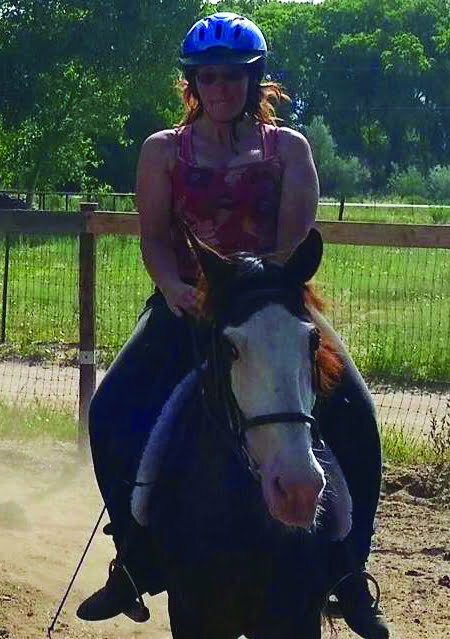 She weighs about 1,000 pounds and, while Turner rides her often, Holly had a few issues since she had been the ranch mascot, like jumping on people like a dog and sucking on your hand, as Turner said most orphaned animals do. Turner’s experience was so good with Holly that she later got Angel from WNCR. Both animals were adopted as companion horses—Holly for the mare Whiskey when cancer-ridden Chile was dying; and later, Angel for Holly when Chile neared death the following year. Turner said that Holly still requires a little medication for her joints. Although there are still visible scars of her first month of life, Holly’s first decade ends as a very happy horse. Holly’s Amazing Rescue is available on Amazon. The book is written for those age 9 and above with art by Judy Haag and several photos of young Little Holly. The author’s wife Mary Ann Shinnick is Walkin N Circles ranch manager. Both have volunteered there since 2011. She loved horses as a girl but never had one, and said, “I couldn’t believe I could be that close to horses,” when mucking stalls. Hudson said Walkin N Circles is involved in a nationwide contest for grant money—which assigns points for adoptions and those pondering adoption, as well as marketing and donations. Like Holly, the little ranch will fight hard to overcome life’s obstacles. For more information on volunteering or making donations to Walkin N Circles Ranch, visit wncr.org.